Tribes that now live on the Northern Plains originally spanned an area from the Great Lakes in the north, to western Montana, and as far south and east as the lower Mississippi. These tribes hunted, fished and farmed on their sacred lands. Beginning in the 1700s, many of these tribes acquired horses. This new mobility allowed them to become nomadic, and several tribes began following the buffalo herds of the Northern Plains. Increasing encounters with white explorers, miners, and settlers in the early 1800s introduced alcohol and disease to the Native people. Entire tribes were decimated by smallpox, warfare, and pressure from the white settlers heading west. The United States government began removing Indian people from their traditional lands, assigning all Native Americans to reservations. Taken from the land that once met all of their needs, Native American people now live on isolated reservations, some miles away from basic necessities such as stores and medical facilities. Usually, the only nearby shop carries mostly junk food. The reservation land is so barren that it’s a struggle to get any crops to grow. Not only is food hard to find on the reservations, so are jobs. On the Pine Ridge Reservation in South Dakota, unemployment is a staggering 86 percent. Removed from their traditional extended family structure and nomadic hunting ways, the Indian people are forced to rely on the government for their basic needs. Sadly, these needs -- shelter, food, healthcare, and employment -- have never been adequately met. 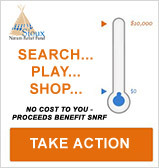 That’s why the Sioux Nations Relief Fund (SNRF) was created. SNRF has one proven answer-- help Sioux Indians improve the quality of their own lives, by providing opportunities for them to bring about positive changes in their own communities. SNRF offers a helping hand, not a handout. SNRF sponsors programs that address a wide variety of needs, from natural disasters to Elder nutrition, for Sioux Indians on the Northern Plains. To learn more about the reservations SNRF serves, please refer to the individual states listed on the left side of this page or the links below.